Nicholas Goodrick-Clarke B.A. (Bristol), D.Phil. 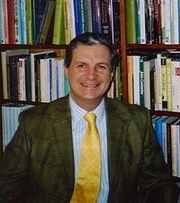 (Oxon) is a professor of Western Esotericism at University of Exeter and author of several books on esoteric traditions. He is the author of several books on modern occultism and esotericism, and the history of its intersection with Nazi politics. His book, The Occult Roots of Nazism, has remained in print since its publication in 1985 and has been translated into eight languages. He has also written on the occultist aspects of neo-Nazism in Black Sun: Aryan Cults, Esoteric Nazism and the Politics of Identity. He is Professor of Western Esotericism and Director of the Centre for the Study of Esotericism (EXESESO) within the School of Humanities and Social Sciences at the University of Exeter in the United Kingdom. He lives in Southern England. Nicholas Goodrick-Clarke is currently considered a "single author." If one or more works are by a distinct, homonymous authors, go ahead and split the author. Nicholas Goodrick-Clarke is composed of 5 names. You can examine and separate out names.